Twelve-year-old Malik had to flee when his village in Afghanistan was bombed. Now he lives in a corner of a bombed-out school with other refugees in Kabul. 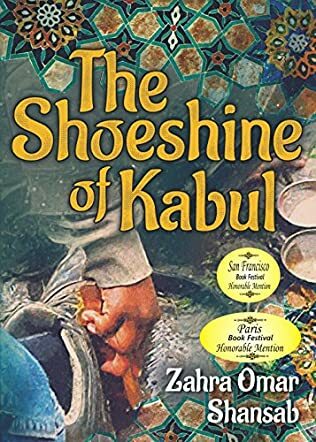 The Shoeshine of Kabul by Zahra Omar Shansab paints a portrait of Malik and his 16-year-old friend Nahim’s lives as they eke out a living shining shoes, earning just enough to buy their daily bread. Life is bleak and Malik has constant flashbacks and daydreams of his former life. And if the trauma he has already experienced isn’t enough, as an orphan Malik is terrified of being kidnapped or, even worse, being killed for his organs. Then one day a chance encounter with a six-year-old boy collecting trash leads to new purpose and a glimmer of hope. Zahra Omar Shansab’s writing is poignant and clear. She writes as someone who has lived through the devastation of war and, in fact, she herself fled Afghanistan during the Soviet occupation. In The Shoeshine of Kabul, the reader gets a glimpse of what the Afghanistan war is like for children and it is heartbreaking. The Shoeshine of Kabul would be a powerful book to use as part of a middle school curriculum to enlarge kids’ perspectives and show a picture of life for kids in very different circumstances. Reading this book, I couldn’t imagine what might give Malik hope, but Zahra Omar Shansab achieves hope and purpose in a very believable, even if tragic way. Highly recommended.